Anna Corrgian opened a puzzling email from the U.S.A. Track and Field Association in mid-January. What had happened was that the USATF had changed the Olympic Marathon Trials qualifying time to match the international standard, adding two minutes to the women’s marathon time in December and retroactively qualifed Corrigan’s 2:44:27 winning time from 2014’s Rock ‘n’ Roll San Diego Marathon. She had three-and-a-half weeks to get ready. She was one of several runners with ties to the D.C. area whose appearances at the trials were hastily arranged, for various reasons. Katie Sheedy, Sarah Bard and Hiruni Wikayaratne also benefited from the new trials standard. [button-red url=”http://www.usatf.org/Events—Calendar/2016/U-S–Olympic-Team-Trials—Marathon/Results.aspx” target=”_self” position=”left”] Results [/button-red]Corrigan, 25, a Lake Braddock alumna, was clueless until that letter arrived at her Phoenix home. She had been running, doing a few long runs to get ready for the Phoenix Marathon at the end of February, but thoughts of competing had faded into the background. On race day, like everyone else in the field, faced hot conditions that she never encountered running in the dark before work in Phoenix. She finished 96th in a field of 149, running 2:54:22, 16 seconds ahead of University of Virginia teammate Emily Harrison, the 2013 JFK 50 Mile champion. Almost a minute ahead of her was 2002 Robinson alumna Bonnie Axman Keating, whom Corrigan had beaten at the San Diego race 19 months prior. 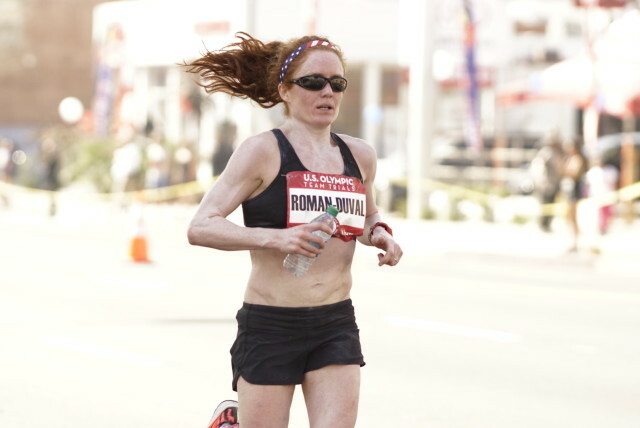 Julia Roman-Duval made the most of a chance she almost didn’t get. Her citizenship not yet finalized, the Columbia, Md. astophysicist was the last to make it onto the start list for the U.S. Olympic Marathon Trials, but when the race went off and the results came out, only 49 people beat her to the finish line. “My time (2:46:47) was six minutes off my PR, but I think a lot of people were farther off than I was,” she said. Because she had a qualifying time from the full marathon–from last year’s California International Marathon, she was ranked ahead of many athletes with much faster half marathon times, so although the bib on her back said 85, she felt she was actually north of 100. Roman-Duval, 33, felt thrown for a loop by the 50+ degree temperature swing from Mid-Atlantic. She’ll continue a lower-mileage approach while she works to break 2:40 (her best time is 2:40:56) and lower her best time to beat the Olympic A standard. She plans to race the Chicago Marathon in October. She dealt with Iliotibial Band Syndrome and a soleus strain leading up to the race, but kept those injuries at bay. ‘Twasn’t ‘til the week before Christmas that Christine Ramsey was finally able to do serious training for the trials. The former Baltimore resident and frequent D.C. racer had been on the shelf since July with a hip flexor injury. She fit in six workouts and five long runs and let’er rip. The longest she ran at one time in the last six months was 20 miles. And she was hell-bent on finishing. She was still recovering from being hit by a car when she started, but didn’t finish, the 2012 trials. “I’ve had to develop a long-term plan with this race,” she said. “Make one trials, finish the next, race the third. Though she lives in New Haven, Conn., she travels frequently to New York, Philadelphia and Baltimore to train on the weekends. Now that she’s healthy, she aiming to win the Philadelphia Marathon in November. American University alumnus Mark Leininger and George Mason University alumnus Everett Hackett both hit their qualifying times late in the game at the Jacksonville Bank Half Marathon Jan. 3. Despite having not run marathons before, they fared well, finishing 60th (2:28:17) and 87th (2:35:08), respectively.